Millions of Americans, myself included, start their day with a nice, hot cup of coffee—that caffeinated kick-start we need to muster the energy and willpower to head into another long day of 21st century chaos. We have a litany of methods—the coffee maker, French press, pour-over dripper, espresso machine, et al.—at our disposal for preparing “the other black gold” at home, and the outside world is peppered with artisanal and chain coffee shops, making sure we’re never far from a cup. But between those two options, something is still missing: what is a coffee drinker to do on the go? While traveling? When camping? When it’s too inconvenient or impractical to bring your own coffee-making equipment, and buying it from cafes is too pricey to do regularly? This is a problem Santa Cruz resident—and coffee aficionado—Josh Wilbur set out to solve. As the CEO and founder of Steeped Coffee, Wilbur has come up with a unique, simple solution to make portable coffee quick, painless and delicious: lightweight “filter bags” filled with precision-ground, direct-trade coffee. “My family is used to me, so I didn’t get too many strange looks,” he adds, laughing. Wilbur tinkered with his primitive concept and, by that December, he had friends sampling his prototypes. He shelved the business side for a few years to sort out some of the finer points he desired in his final product: Ethically sourced coffee, quality beans, freshness and density of grind, controlled water permeability in the filter bags, and environmental sustainability. Once he was convinced the fledgling business had nailed those, Steeped Coffee was officially born. Roasted locally in small batches, Steeped Coffee comes in single-serve packets that you can fit in your pocket. All you need is a cup and some hot water, five minutes to let it steep, and, if you are indulgent like me, sweetener and some kind of milk. This clever design led the company to nab a 2018 NEXTie award for Most Innovative Company of the Year. When I sampled the light roast “Sunrise Blend” on a sunny afternoon in late March, I followed the simple instructions: heat water, pour into cup with bag inside, then dip the bag around and swirl. The company suggests five minutes to allow it to steep, after which you can leave the bag in while you sip. 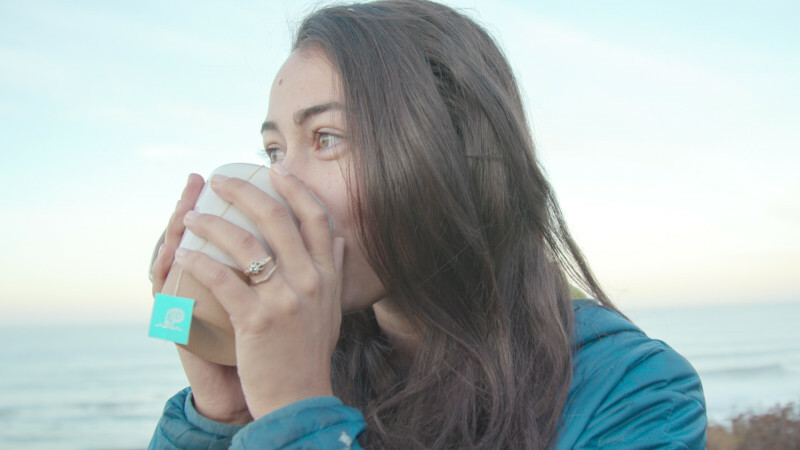 Unlike the bitterness that results from leaving a tea bag in your mug too long, Steeped Coffee only gets stronger and more flavorful until it finally plateaus. I took Wilbur’s advice to “Let it ride!” and found that the taste never became too acidic or harsh. 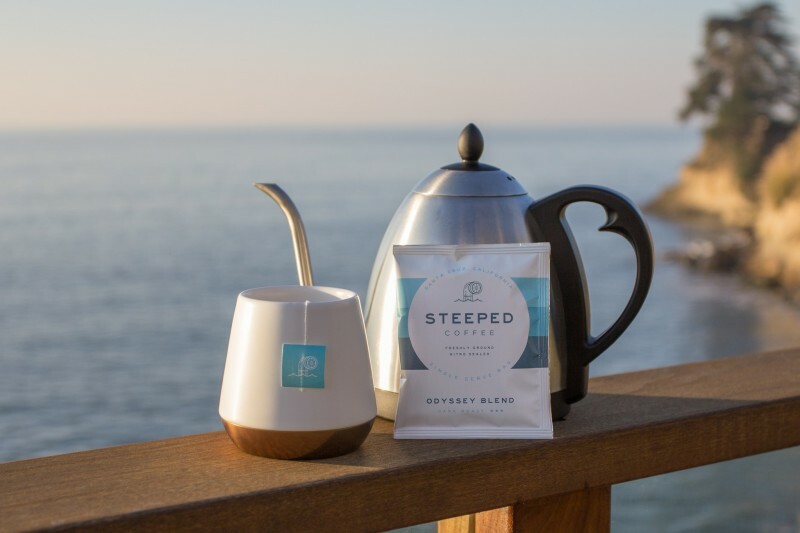 Steeped Coffee developed a way around that problem: “With our nitro-sealed bags, oxygen is replaced with nitrogen, so the coffee stays fresh, as if it was ground moments ago,” Wilbur says. A much-appreciated form of coffee-withdrawal prevention, the company’s single-serve packs are ideal for backpacking, road-tripping, long days at the office and any other situation in which a quality-coffee-lover needs to know where their next fix is coming from. Steeped Coffee is currently available for one-time or subscription purchase at steepedcoffee.com. This entry was posted in Business, Featured, Local Loop, Opinion, Spotlight. Bookmark the permalink.